It’s that time of year again, the morning and evening are starting to become dark, it is important to be prepared and stay safe. Simple accessories such as head and rear lights can save you from an avoidable accident. So with that in mind we have looked through this seasons cycling lights and picked out the top products and technology, that we think you should look, to make sure you make the right choice when it comes cycling in the dark and staying safe. There is much to be said about blaze, it is one of the first genuine success stories of Kickstarter and it is easy to see why when they are producing products like the Laserlight. Built to last, Laserlights’ sturdy, diamond cut quality finish aluminium body is waterproof, not just water resistant and is partnered with a marine-grade steel bracket for extra support. The Blaze Laserlight is made up of two outputs, a high quality 300 lumen LED light with 3 settings and a bike image that is laser projected 6 meters ahead of you. In an independent study, it was founded, that the Blaze Laserlight improves visibility within blind spots in a range of different vehicles. This light lends itself to being an urban safety light for commuters, to maximises visibility in a way that no other company is doing. The versatile Fabric FL300 is an aluminium, LED front light. Additional red LED lights run down the side of the body allowing you to use it as a rear light. A unique function dial can be located at the rear of the light that makes switching between modes easier. The FL300 front light will burn for two hours at its highest setting while the low beam will burn for five hours. The micro USB charge slot makes it easy to recharge the light at home or in the office. This year Lezyne have introduced the new Hecto 350XL, which is a multi-purpose performance LED cycling light. the Hecto 350XL uses a single ultrahigh LED system that delivers up to 350 lumens. The Hecto 350XL has 7 output modes and an 18-hour battery life. Charging the light could not be easier, with a cable free USB connection integrated onto the light. Lezyne have packed the Hecto 350XL with features such as their MOR (Maximum Optical Reflection) to provide a more efficient beam, built in side visibility to increase visibility and safety and a power indication button that changes colour based upon on the battery. 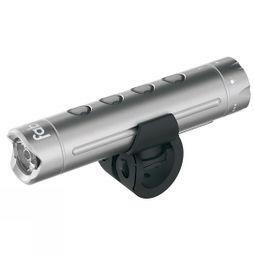 For only £30.00 the Lezyne Hecto 305XL delivers a high lumen output with multitude of features in a compact, elegant body, perfect of any cyclist. The Lezyne Micro 450XL and Strip Drive have been packaged together this year for only £70.00, making it a premium high lumens front and rear light system at an affordable price. An update to Lezyne’s popular Micro, sees the LED light increase its Lumens up to 450 lumens. The Lezyne Micro is a compact and durable headlight within an aluminium construction, with enhanced MOR (Maximum Optical Reflection) lens with built in side visibility to keep you visible and safe. The device is easily charged with a cable free USB input and has an advanced Li-Poly battery for superior run time. The Lezyne Strip Drive is a five LED cycling Taillight that delivers up to 25 lumens. The taillight has 9 combined lumen and flash models that is accompanied by a Mode Memory function to save you time. Just like its counter partner the Strip Drive has enhanced MOR lens and built in side visibility. 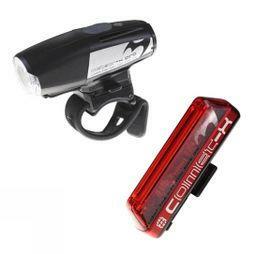 This package is idea for any cyclist who is looking a premium quality light set up, without the premium price tag. Excusive to Cycle Surgery is the Moon Meteor Auto & Comet-X set that offers a great light set at an affordable price of £50.00. Moon Meteor Auto is a bright front light that delivers 450 lumens with a burn time of up to 24 hours. The aluminium heat sink light cap helps to regulate heat by 15% -30% that works to make the battery and light last long. The Meteor Auto includes 7 modes to help you choose the best light for your surroundings, whilst the memory mode saves you time trying to find the previous setting when turning the light back on. Its counter partner Moon Comet-X its super bright 50 lumens rear light that matches the feature of the Meteor Auto with 7 light modes, aluminium heat sink light cap and USB rechargeable. The pair go hand in hand and is a great option for cyclist on a budget. Kinetic Technology is the latest innovation in cycling lights. With more than half of all cycling accidents involve collisions by cars from behind or side on, the Kinetic system was developed to work as a brake light, boosting road cyclist safety. The system works by using an acceleration sensor, which tracks the cyclists’ acceleration and deceleration. When deceleration is detected the Kinetic mode switches on, causing the light to turn to its brightest, informing those behind that the cyclist that they are slowing down. The new Kinetic technology can be found on two products within the Cycle Surgery Range, Cateye Kinetic X2 Rear and Fabric FL30. The Cateye Kinetic X2 has a 180-degree line for sight that provides superior visibility, for both behind and side on view. Thanks to its high 50 lumens output, you can use the Kinetic X2 anytime of day and still be visible. Kinetics X2 comes with 6 different modes that allows you to choose the light pattern that best suits your riding environment. With a 2-hour charge time, via USB, the Kinetic X2 can run for up to 30 hours. The additional Battery Auto Save helps to preserve low battery, to ensure you are not left in the dark. The FLR30 rear light is the second product in Cycle Surgery’s range that uses Kinetic technology. Fabric FLR30 offers 30 lumens in a more compacted solution that is aimed at commuters. Being designs from within the UK, Fabric has made the FLR30 with a water resistant housing, making it perfect for those rides home in the British weather. The FLR30 is micro USB chargeable and has an 8-hour running time. The 30 lumens light comes with a nylon-plastic bracket that allows the light to be positioned in one of 20 indexed positions.